I have been a huge fan of Susan Hills' novella The Woman In Black since I saw its adaptation for the West End for the first time in 2008. The production is the second longest running in London, currently in its 27th. This atmospheric ghost story is cleverly told and the build up of the horror and the suspense is palpable from beginning to end, which terrorises the audience. Earlier this year, independent theatre company, RedFox 3 staged this production in Healesville and Warburton, and next month will be giving Melbourne the opportunity to experience the horrors of The Woman In Black for themselves, during a limited season at the Alex Theatre in St Kilda. "It is a classic story that is told well. The theatre experience is like no other, it captivates the audiences imagination in such a clever way and they just run with it," director Justin Stephens says, explaining its longevity. "You can take almost anyone from 9-90 to this show. It's a great way to spend two hours and forget everything else. It's just pure entertainment." Stephens has similarly had a long fascination with this story, going back to 2008 when he was cast in a local production of the play. "I already knew of the show and wanted to be involved immediately. 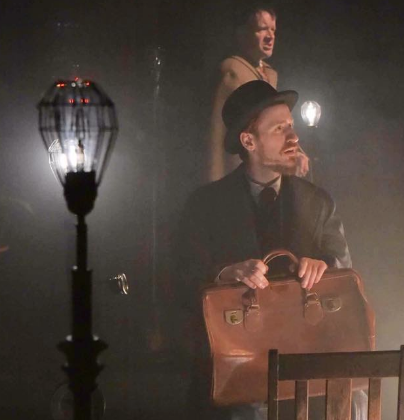 Then when I began directing, The Woman In Black was near the top of my short list and so I jumped at the opportunity to mount a production in 2013 and this season is based on that production with many of the same creatives involved. The story is a favourite of mine and it is the perfect launching pad for RedFox3." While staging the play but remaining true to the story, Stephens has found some innovative ways to make the production original and not a carbon copy of its predecessor. "The play is clearly very popular and has been performed many times before. Having been in it and seen it before, I wanted to refresh elements so that it works for those who have seen it many times, whilst not meddling with the core ingredients that make the show so special," he explains. "Firstly I wanted it to be genuinely scary, surprising, and create a sense of dread, whilst highlighting some of the shows more lighter moments. The soundscape is all new and original, and it's a character unto its own. This production also has a strong steampunk flavour to it - an emerging technology of the Victorian era that never existed - which allows for some extra creative freedom to added." "The most important element however is the 'appearance' of 'The Woman' herself. A decision I made early on was to not concern myself with making sure that every audience member could see 'The Woman', or every single part of the play at all times. The darkness plays tricks on you; some people miss the initial appearance, others glimpse 'The Woman' in other moments, and occasionally we have some audience members scream out absolutely nothing at all!" One of the great aspects of The Woman In Black is the complete lack of blood and gore. All the horrors created are cleverly constructed by the technical aspects of the production and what your imagination begins to run with. With only three performances, tickets are likely to sell quick, so take a deep breath and allow yourself to be enveloped by 'The Woman'. If you like being scared then this is the show for you!